Part of what I'm trying to do with the new www.QuiltingBusiness.com web site is provide links to some good information from other sources. That includes other quilting blogs and websites, and also the occasional general news story. I came across an interesting article in the Lifestyle section of the Orlando Sentinel about decorating your home with quilts (NOTE: The Orlando Sentinel has placed the article in a paid archive – I have found the new link in the author's original newspaper, the Hartford Courant). The article is about how “decorators have long appreciated the versatility and artistry of quilted fabrics.” And why am I linking to this article? It makes a lot of sense to go beyond just traditional quilts and look at how you can use your quilting skills to create other quilted items for sale. And, since many of these items are smaller and take less time, they give you an opportunity to offer a range of products at different prices, from low to high. This gives you a big advantage at craft shows. By being able to create smaller quilted items, you can produce more and be able to sell at higher volumes. Plus, customers who have purchased your smaller products are more likely to purchase a big ticket item if you stay in touch (and you are building a database of customers and prospects, aren't you?). Take a couple of minutes and check out the article at the OrlandoSentinel.com website. Read the article with an eye towards coming up with your own ideas for expanding your quilting product line. 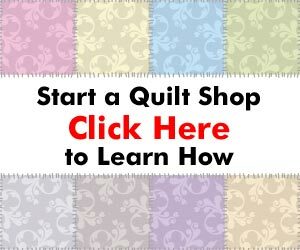 It's a great exercise, and could bring you one step closer to your dream of opening a quilting business, or give you a great entry-level product for your existing quilting business.